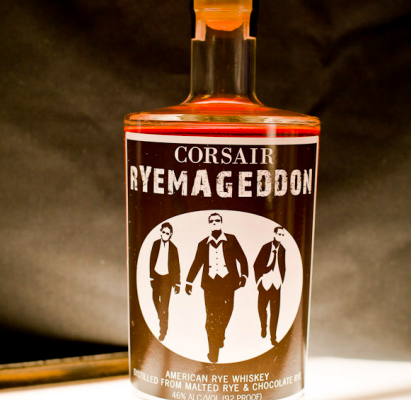 Corsair’s Ryemageddon is an aged version of their Wry Moon, Rye White Whiskey. It is made from local grains- malted rye (80%) and chocolate rye (8%), and red wheat. It is distilled first in Corsair’s antique wash still and a second time in a copper pot still. It is aged for a bit less than a year in small (15 gallon) charred oak casks. The nose shows dark roast coffee, unsweetened chocolate, grain, and some obvious heat. It goes through very distinct phases on the palate. Up front, it is surprisingly sweet and fruity. Chocolate covered strawberries, coffee, and marshmallow. It takes a turn to unsweetened chocolate and peppery rye, with hints of cayenne, particularly on the back of the palate. Dark and milk chocolate linger on a very long finish. This is a fascinating spirit. The rich chocolate and coffee aromas, the sudden shift from sweet to savory, and the lingering chocolate finish are each interesting in their own right. Their march from nose to finish, all in one glass, allow contemplation and thought, study of each step and each flavor.